Battle Baptists were 2-0 winners at home to Ninfield United in a crunch clash at the foot of the Macron East Sussex Football League Premier Division on Saturday. Oliver Jeffs struck in the fourth and 55th minutes, both from corners, to give Battle their second successive victory and move them off the foot of the table. With two teams due to go down, Battle are now a point behind third-bottom Ninfield and three adrift of fourth-bottom Rock-a-Nore with a game in hand on both. Ninfield and Rock-a-Nore both have to play second-placed Hollington United in their final matches, while Baptists’ two remaining fixtures are against sixth-placed Iden. Hollington moved into second place with a 4-2 win against a Robertsbridge United side which finds itself back at the bottom of the standings. Hollington were 3-0 ahead by the break and 4-0 up after 50 minutes before the visitors scored two goals in four minutes via Phil Green and Sam Betts just after the hour mark. Reece Johnson scored twice for the home side, while Glenn Woodhurst and Alan Foster added the others. Iden were 6-2 down at half time en route to an 8-3 defeat in an extraordinary game at home to Peche Hill Select. Wayne Giles starred for the visitors with a four-goal salvo, Steve Johnson registered twice, and there was one each for Jon Hatch and Connor Robertson. Chris Gould scored twice for Iden, whose other goal came from Sam Cooper. Mountfield United have regained top spot in Division One following their 4-1 home win against Wadhurst United. Despite a long range effort from Wadhurst’s Callum Christie bringing the score back to 2-1 after the break, two Mountfield strikes in the last 15 minutes confirmed the destination of the points. Leon Pettit bagged a brace for Mountfield, while Ben White and Steve Fortsch joined him on the scoresheet. Ticehurst moved a step nearer safety with a convincing 7-3 win against now relegated Icklesham Casuals. Leon Fisher scored a hat-trick for Ticehurst, while Darren Nicol, Rob Briley, Ash Burrows and Rob Guile chipped in with one apiece. Nathan Chandler bagged two goals for the visitors and Jack Davies also netted. Division Two leaders Eastbourne Rangers suffered only their second league defeat of the season with a 2-1 loss away to third-placed JC Tackleway. Two Charlie Cornford strikes swept the hosts into a 2-0 lead before James Strong pulled one back. There was no further scoring after the break, although Tackleway were grateful to a top class save from Jason Soan. Second-placed Old Hastonians maintained their four-point advantage over Tackleway, albeit having played two more games, with a narrow 1-0 win away to relegation-threatened Catsfield. On a very heavy pitch and in windy conditions, few clear-cut chances were created by either side, but Loukas Bradbury came up with the decisive strike in the 50th minute. Crowhurst eventually triumphed 4-3 in a topsy-turvy contest against visitors Wittersham despite seeing a 2-0 lead turn into a 3-2 deficit. Two goals from Nathan Sherwood and one from Ashley Spice for a while turned the match in Wittersham’s favour before Crowhurst struck twice late on. Gary Croft scored twice for the home side, while Jordan Turner and Nick Walker netted the others. Herstmonceux have almost certainly made their position safe after defeating Pebsham Sibex 4-1. Sibex didn’t help their cause by having a player dismissed as early as the 13th minute, although Lee Smart brought them back to 2-1 for a spell in the second period before the visitors won comfortably in the end. Ali Thompson fired in two for Herstmonceux, with David Taylor and a Tom Budd penalty completing the total. 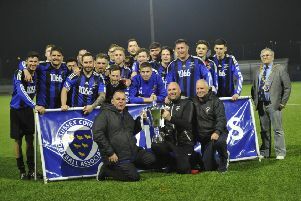 Premier Division side Ore Athletic edged through to the Hastings & District FA Intermediate Cup final after scraping past Bexhill United II 3-1 on penalties. Harry Cawkhill turned out to be Athletic’s hero by saving three spot-kicks from Macron Store Sussex County Football League Reserve Section (East) team Bexhill. The tie had earlier finished 1-1 at the end of normal time and 2-2 at the end of extra-time. Matt Sellick gave Athletic the lead on the half-hour mark after a period of pressure, but they were pegged back to 1-1 by the break after a mistake from Cawkhill. There was no further scoring during normal time. Bexhill went 2-1 up 10 minutes into extra-time, yet Grant Cornelius converted an Athletic penalty with five minutes remaining to force the shoot-out.